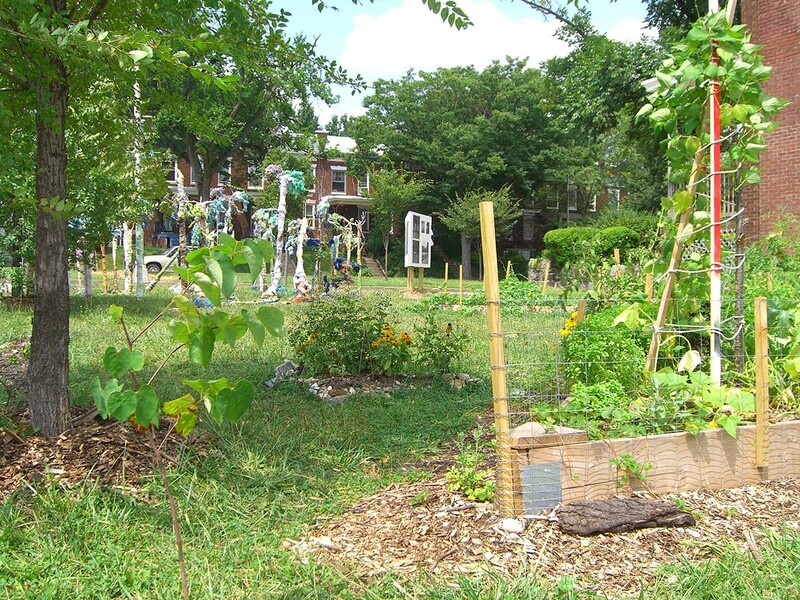 Tinges Commons is a community garden and do-it-yourself public art space at 33rd and Frisby Streets in the heart of Waverly. 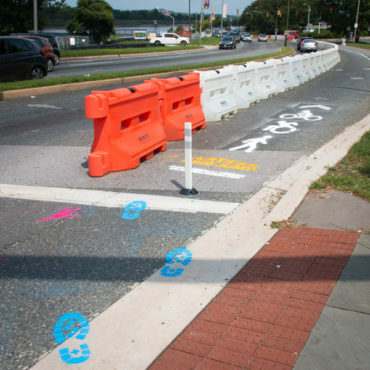 The space stands on an un-paved, right-of-way that was created in 2004 when Frisby Street was re-aligned fifty feet to the west during the construction of the Waverly Crossroads Giant Supermarket. The street was moved in order to create a free flowing intersection at 33rd Street that would accommodate motorist access to the supermarket’s massive parking lot. What remained on the southeast corner of 33rd and Frisby Streets was 38′ x 60′ lot of grass, a few small trees and a lamppost. 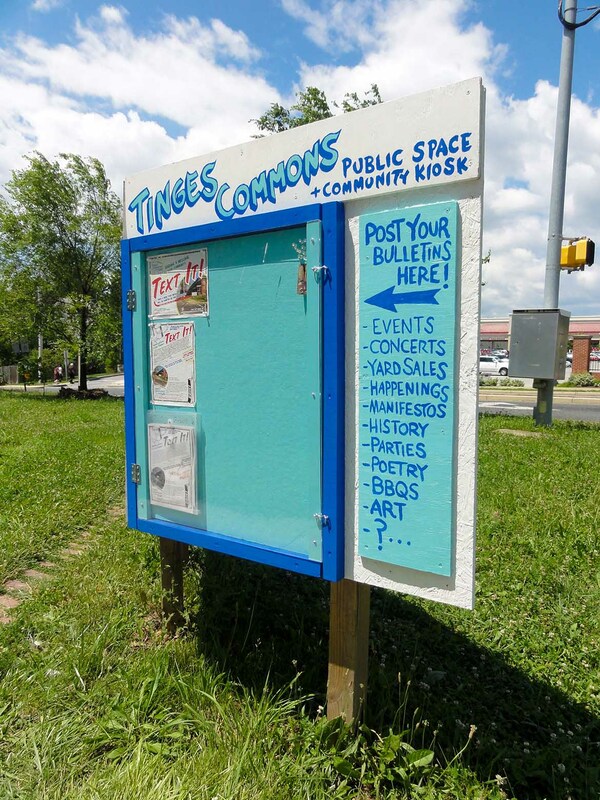 The name “Tinges Commons” is a tribute to Tinges Lane, a street that disappeared during the construction of the Giant supermarket. The conspicuously unused lot inspired re-inscription among neighboring artists and local volunteers, including myself, Jimmy Joe Roche, Peter Cullen, Cheryl Carmona, Clarissa Gregory and Colin Benjamin. 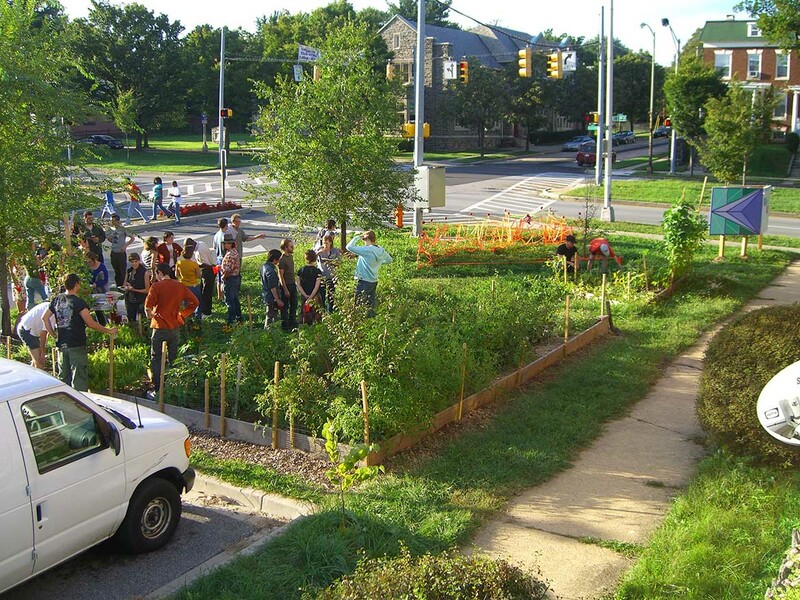 With guidance from members of the Better Waverly Community Organization and the nearby community garden Homestead Harvest, we began organizing Tinges Commons in October of 2008. 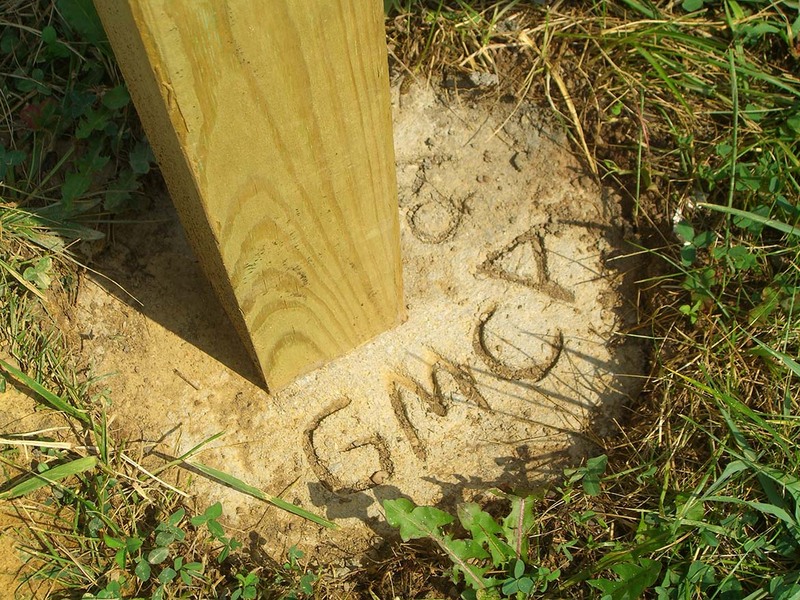 After securing an adopt-a-lot lease from the city in March of 2009, we applied for grants, built and planted raised beds, and began organizing an ongoing series of site specific, public art projects. Inspired by the diagonal footpath, we envisioned reverberations of wood triangular, framing gardens and staging art. 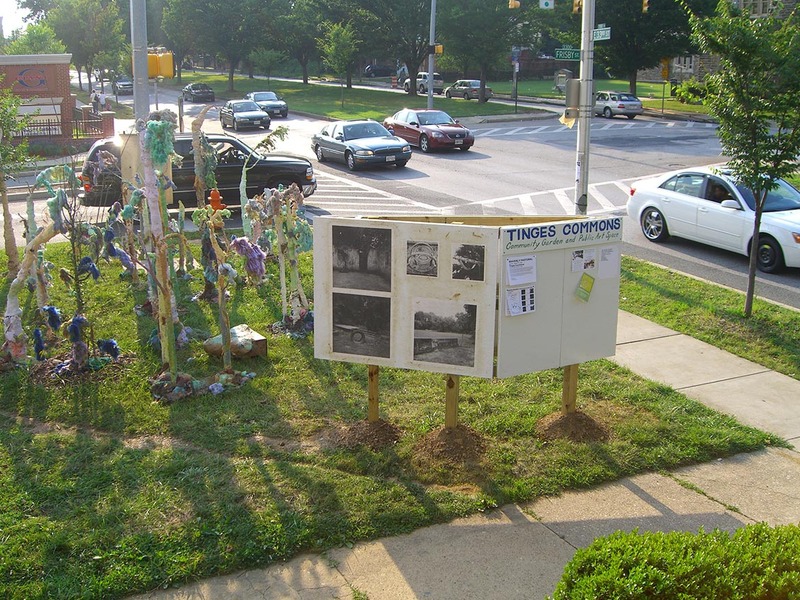 In July 2009 I constructed the Tinges Commons Kiosk, or TCK, is a sign structure and pin-up board for artists setting up outdoor installations and public users interested in distributing information at Tinges Commons. 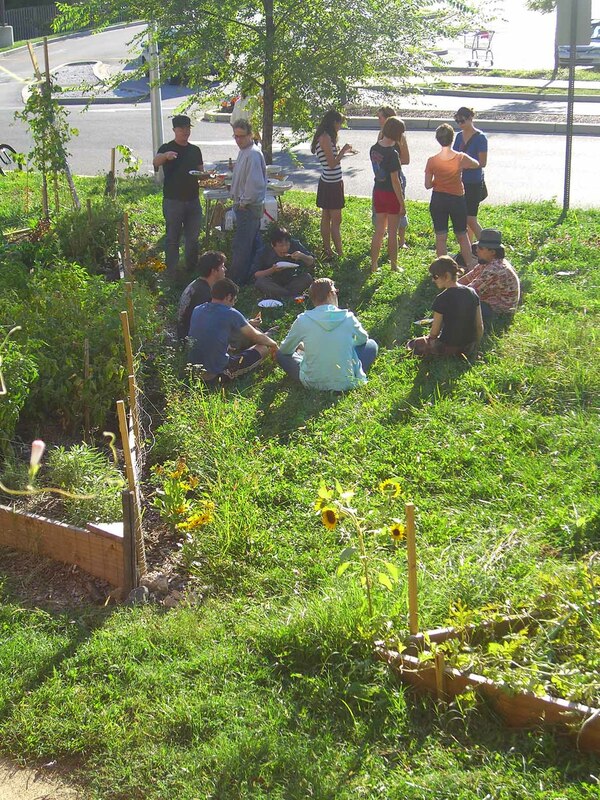 Tinges Commons is a community garden and collaborative public art space. Mirkwood Estates is located at 701 East 33rd Street, Baltimore, MD 21218. The kiosk’s three sides each address separate but overlapping traffic flows: The narrow side faces the Frisby Street sidewalk and is clad in homasote for people to pin up neighborhood flyers. Meanwhile, the south side faces the diagonal path cutting through the commons while the north and widest side faces 33rd Street. These two longer sides serve as installation surfaces for artists setting up projects in the lot. 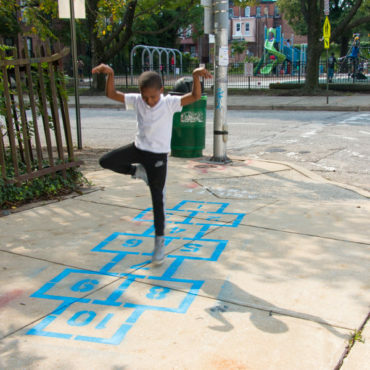 This curatorial/community structure, creates an enhanced site of public art, collaboration and neighborhood communication. 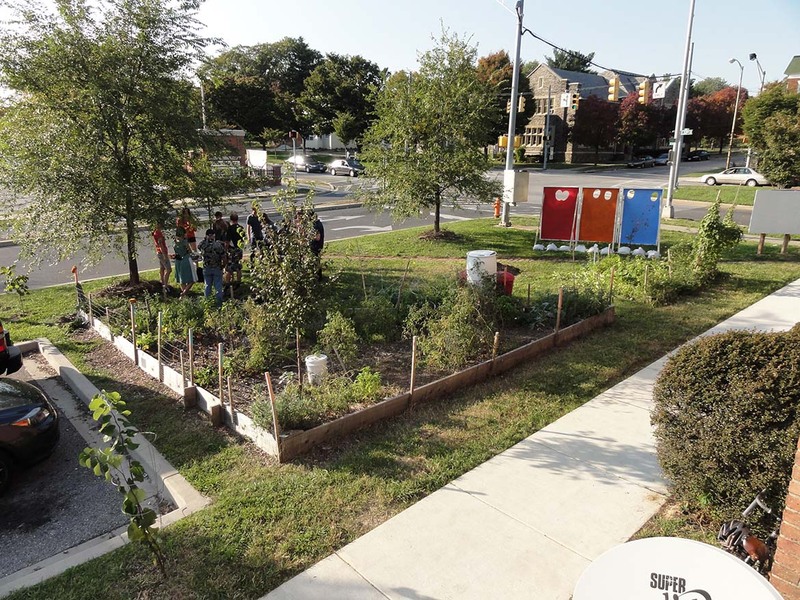 Food harvested from the garden was shared by the volunteers and neighbors on a weekly basis, and made available to the community during public events. 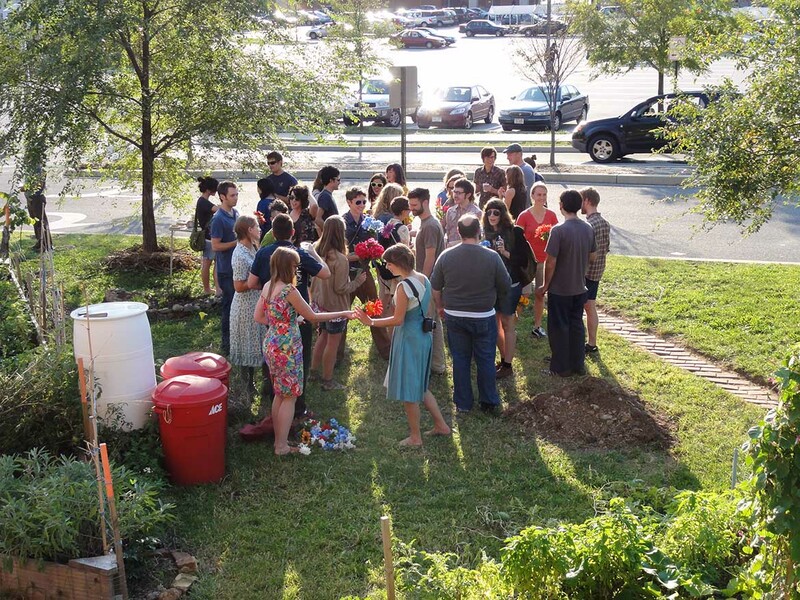 Serving as both public art openings and potluck-style feasts, these events featured collectively prepared dishes shared by mix of friends, residents, art-enthusiasts and passers-by. 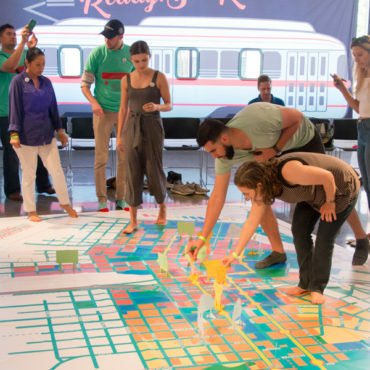 For the public art shows, artists were invited to create mid-scale, 2-d and 3-d projects that engage the various flows of pedestrian and motorist traffic within and around the highly-visible corner location. Weather locating hidden green spaces or sharing colorful poetic phrases, the curated and community projects were always embedded with a strong relationship to place. including cars, buses, bicycles and pedestrians. with new dimensions second, third and fourth. where organic food counters food – over the counter. In July 2011 Vistaflow Tower was constructed to provided a public viewing platform and drip irrigation system for the garden. 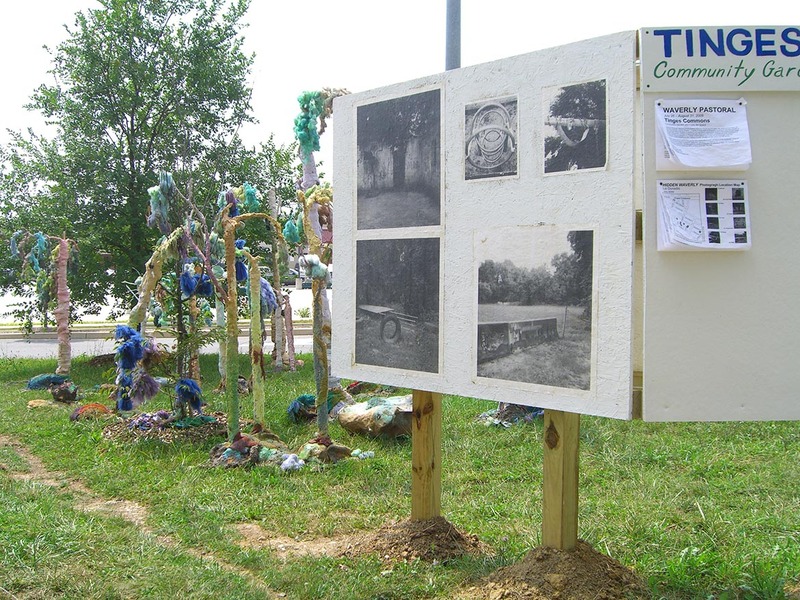 Update: Due to volunteers moving onto other art and greening projects, the Tinges Commons community garden was retired over the spring of 2012. 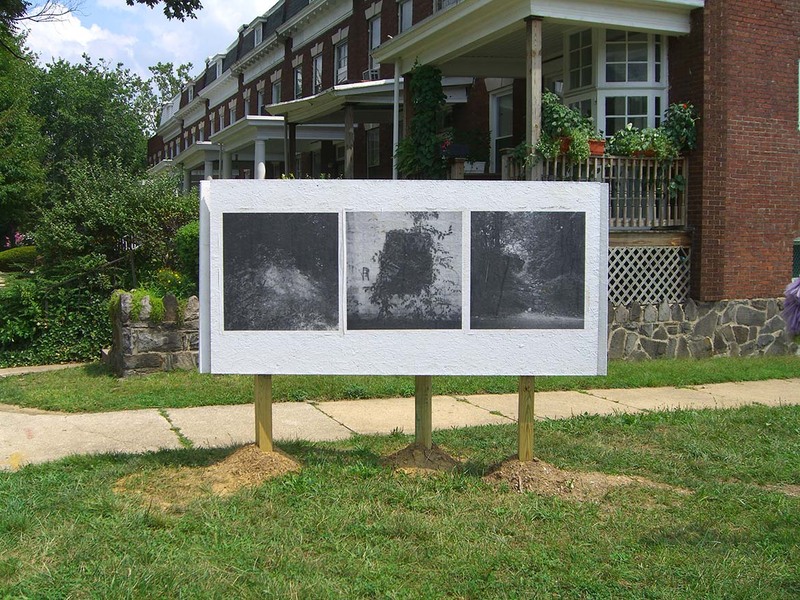 The public art kiosk continues to be curated by residents of the Mirkwood House.